The 2016 AXPONA show is over. On Sunday afternoon, the organizers stopped by to ask if AIX Records would like to reserve the Lakeshore B ballroom for the 2017 show. It’s a hard…and expensive…decision. On the plus side, it’s great to be able to demonstrate what real high-resolution music sounds like through a real high-resolution audio system (the only one that I was aware of at the show!). The comments were uniformly positive with many people coming back time and again to sit and enjoy my recording through a terrific system. There was one gentleman that sat in the sweet spot for over an hour. When I asked him why he stayed so long, he said, “Mark, there is nothing in any of the other rooms that’s half as good as what you’re doing here.” That was a very nice compliment. Of course, a great deal of the credit goes to my friends and partners Oppo Digital (customized BDT-101CI), Dolby Labs, Benchmark Media (DACs and Amplifiers), DH Labs (Cables), Revel Salon II (speakers), and Kenwood JVC (RS-600 4K projector). The sound in the Lakeshore B ballroom was second to none and the content we played blows away usual demonstration content…analog or digital. But there’s a downside too. Vendors spend a great deal of money to secure a room (especially a big room), move their equipment to and from the show, house and feed their representatives, and pay for plane tickets. For a small company like my own, it’s way too much money to make sense. But we’ve managed to pull off a spectacular room at AXPONA since its inception back in Jacksonville, Florida. Our location in the hotel is less than ideal, too. Attendees don’t find us as easily as the big rooms at the other end of the hotel. We’re near the marketplace and people are in purchasing mode when the get in the neighborhood. But I’ve decided that AIX Records and our partners will be back next year…in spite of the lower than expected sales, the lack of press coverage, not being invited to be part of the conference sessions (there was a time when I gave the keynote address at the AXPONA show), and the increasing cost of participating. We’ll see what comes together next April…but we won’t compromise on the experience visitors have come to expect. The most unfortunate thing about expending all of the time and resources to pull together a truly state-of-the-art system is the lack of press coverage. There were a few online reports (Secrets of Home Theater and High Fidelity) but other coverage was completely missing. 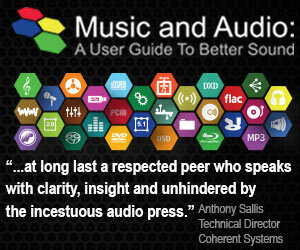 The major and minor audiophile sites and magazines ignored the room. How can a reviewer write a piece about the “best sound room at the show” and not have visited at least the major ballrooms? 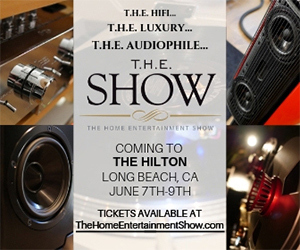 To ignore the only high-resolution capable, surround opportunity at the show strikes me as irresponsible…especially when these same publications have written glowing reports in the past and even awarded us “best sound” kudos. I’ve read a number of the show reports. It seems the rooms with the largest equipment array, best dramatic lighting, loudest demo material, most ridiculous cables, and most expensive price tag come out ahead. I heard those rooms and was not impressed…they were nice but not great. By contrast the AIX Records and partners room had a single table with an Oppo BD player and three single rack unit high/half width Benchmark DX DACs. That was it! 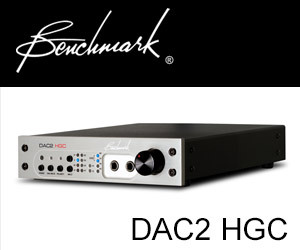 The DH Labs cables connected the outputs of the DACs to the Benchmark AHB2 Power Amps (which are also very small, don’t have glowing tubes). The 5 Revel Salon II speakers were large freestanding towers but certainly weren’t the largest speakers at the show. I guess size and cost do matter in audio things. For those many attendees that sought us out, they were blown away…again. I played acoustic tracks, vocal tracks, jazz, and classical music from a new Blu-ray sampler disc. It was magical. You don’t need volume to show off a great audio system. It’s sad that the people that visit and write about these shows don’t bother to check out one of the best rooms at the show. Glad to see that Robert from Secrets was able to visit your room and listen to the setup. I’ve never had the pleasure to attend AXPONA but one of these days I hope to. Now, while the system you had there was not the most complex and expensive at the show it wold be probably more than what an average home listener might want to deal with. I’m curios to know what kind of affordable or accessible system you think a home lister should have in order to get the best result when listening to your disks? It doesn’t have to cost a lot to assemble a really great sounding system. I would suggest an Oppo BDP-105 (or a used BDP-95) with the ESS Sabre DACs, a reasonable A/V receiver with external analog inputs (Denon, Yamaha, or Onkyo), and 5 speakers of your choice (I like B&W line but the ELAC line is getting a lot of attention). A setup like this would cost less than $5k. I am shure that AIX had the best room at Axpona. I have also some of yours acoustical recordings that sounds the best even in my low-middle system. I regret that these shows are too far from my country (about 8000km) but i am looking forward to receive the demo audio pieces and the pdf format audio book from you. Best regards and keep doing what you do!! Thanks Dan. I spent a couple of weeks in Bucharest back in 2001 recording the George Enescu Philharmonic Orchestra. A beautiful city and a wonderful orchestra. Google notes today in its search engine home page the 100th anniversary of the birthday of Claude Shannon one of the most important contributors to the mathematical development and understanding of communications systems. He along with others like Nyquist developed the concepts that virtually all serious scientists and engineers around the world have relied on to develop the modern world of telecommunications and information technology as we know it. At Bell Telephone Laboratories in Murray Hill where his work was done, there has been a two day celebration attended by a lot of very important people in that industry, the real heavy hitters. There is only one tiny group in one niche market I know of that rejects this understanding and insists it is inadequate and that is the so called high resolution audio advocates. I think they’ve got you guys surrounded. None of them could take you seriously. Whatever advantages your systems have over others, they are doubtless attributable to factors other than exceeding the requirements defined by Shannon and Nyquist. Mark, as you know I consider myself a strong advocate for high-resolution music AND I believe that Nyquist and Shannon established the “rules” of the game. If someone makes a great recording, it will sound great in a variety of formats. The question for me when deciding which format to use is whether that format will diminish the fidelity of the original recording. The analog formats—reel to reel and vinyl LPs— might reproduce a very pleasing sound but they reduce the fidelity of my tracks. DSD reduces the fidelity as well. The only one that maintains everything that I started with is 96 kHz/24-bit PCM. It’s easy, affordable, and available to everyone. Simple. First of all, I want to congratulate you on creating a successful business that produces products that you and your customers enjoy. As you know there is a lot of controversy in this industry. For example at PS Audio Paul McGowan’s team invented a way to convert PCM to DSD before converting it from digital to analog. They claim it is better. Their guru in this regard Ted Smith said he had to find a way to overcome the standard clock jitter and better the performance of 2 parts jitter in 10 billion. His proof of superiority is his measurements with his toe tap meter. I couldn’t make stuff like this up folks, this is real. Yes those who listen to his D/A converter tap their toes more according to him. Now PS Audio is about to introduce a player that will extract DSD directly from SACD recordings in a way which will not violate Sony’s patent. Good luck Paul. He doesn’t like it when I point out virtually the entire world lives in PCM. Everyone’s got an opinion. For me, products shown at places like Axpona only prove that the industry continues to tweak what it already has at ever escalating prices. Last year’s darling is this year’s dog. Revel Salon Ultima II is one of John Atkinson’s favorite speakers. I think he likes YG acoustics Sonja 1.3 even better. It only costs 5 to 6 times as much. From his measurements 1.3 not as nasty an electrical load for an amplifier as the 1.1 was but it’s no walk in the park either. Of 3 amplifiers in the $45,000 range the best of them had problems with it. You can read it in his report. PS Audio’s new BHK (Bascom King) amplifier seemed to have no problems with it at RMAF I think according to Paul. I’ve never heard the Salon Ultima’s myself but I could easily afford to buy a pair myself if I wanted them, JA can’t. You can get them new for a mere $16,000 a pair without even quibbling if you really like them. I think they list for about $23,000. My own interests veered off from audiophilia nervrosa a long time ago, in 1974 in fact. That happened when IMO I solved the problem with a new mathematical model of sound and acoustics that came to me like a bolt from the blue. A very simplified and somewhat compromised version of my invention based on it can be seen in my US patent 4,332,979 which is now expired. The full explanation is a mathematically rigorous proof and a machine to fully exploit it would be expensive and complex far beyond anything an audiophile system could be. I probably have the world’s only working prototype. It’s only the second one I’ve ever built. There are no commercial interests or possibilities for this technology in this era or since the patent was issued in 1982. It will remain a one of a kind curiosity. RBCDs are an excellent format for it, vinyl records less so because it makes a pop sound like a canon shot. In assessing other radical ideas, in its ultimate development my theory I call Acoustic Energy Field Transfer Theory appears to converge with Wave Field Synthesis Model but comes to it from an entirely different direction. Full development of that technology has never been implemented for the same reason. In discussing WFS with professionals working on it, one of their biggest problems is how to measure the parameters they need to implement it. That is something I figured out for my method from my analysis although a measuring system based on it has never been built let alone tried so it only exists on paper. This is not about minor incremental tweaks and although works for any kind of recording is best suited for sounds of unamplified musical instruments normally heard at very large spaces. 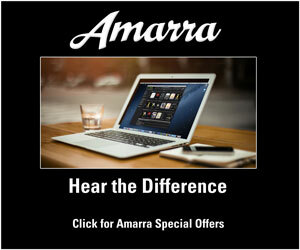 Continue to do what you do best, offer common sense about true unaltered sound reproduction. You are one of very few that back up opinions with logic and fact. I made it a point to attend Axpona on a Sunday, less distraction from multiple conversations going on in the listening areas. I heard that Elon Musk does not display the Tesla models in car shows (except in Montréal). From a marketing point of view, it is a bold move. But it seems to work. Surround high fidelity is still a novelty for most people. Like from the major car builders regarding electric cars, high-res surround music seems to be rejected from the traditional stereo journalists. Perhaps, your production should be exhibited more in an innovation show, than regular audio shows. Despite the number of mfr’s who have “It’s all about the music’ or some variant as their pitch, it isn’t anymore. It’s about equal parts conspicuous consumption and neurosis. Reviewers report on $50-80K loudspeakers and $2K power cords as if that’s actually defensible. The commercial reviews seem based, consciously or not, on giving exposure to their advertisers. It’s all about voodoo and/or “look-how-expensive-my-system-is” these days. Most of the gear I see, I wouldn’t buy even if I won the powerball. You’re right Dave. The whole industry is about expensive, impressive, big components. The more Chrome the better. Please just keep on doing what you are doing. I’ve learned so much. Thanks Mark. Just wait for the book…it’s coming along. Thanks. only short journey with you but the most enlightening one. Been a fanatic since the 60s and first time i have found someone that can explain differentiators in understandable language with no bs added. Congratulations with the show, would have loved to be there. I have downloaded some of your test tracks and best i have found. We can’t get HD tracks in Africa, so can’t comment, but certain will struggle to match. Imho to increase feet and bums is marketing and advertising. You seem to get the right partners and sure they will assist in such a budget. Increase in traffic bring some new challenges, bigger disparate audience with different preference in music, wanting to take something away. Run education talks, will be more demand on you and team’s time. Expect special pricing for product at the show. Pleased to hear you will be doing again, your introduction and education to exceptional sound reproduction for man in the street will be relative to spreading the word. No harm in talking to innovative marketing firm that understand the space and customers you want to attract. Maybe short different sessions during the days with focusing on specific music, Classical, Jazz, Big Band, Country, Blues, Rock, etc. That increases probability of return audience. Offer bargain special multi-day packages including accommodation for supporters from faraway places like Africa. Thanks Tom. I will definitely be trying to fund promotional opportunities at shows like AXPONA and the Munich show. I concur…great show, great sound. I bought a few items from the booth…and would have bought more, but there were not many new releases. I like the suggestion above to have short sessions highlighting HR reproduction of different types of music. Just happened to stumble onto a you tube vid. of a radio host speaking with you regarding high res music. How is the music delivered? On Blue Ray, DVD, downloaded, other? I find all this new jargon very confusing, since at my age I was not bathed in the mystic waters of bits and bytes. Would I need to download your high res music or is it available on something like Blue Ray, which I have hoped would one day be the standard for Audio recording, but which I was assured would never happen. Don’t know why, something to do with piracy, I hear. Come to think of it, I just realized I have a double sided DVD “Soular Energy” Which I play on a cheap DVD player through a pretty good system, and this is the best sound I have got out of that system, (Bryston Amp, Ref 3A speakers,) I would love to be able to buy music of this quality even if I already owned the CD or Vinyl. Phillip, thanks for the coming by. I record all of my productions at 96/24 and then avoid any processing during the post production phases. 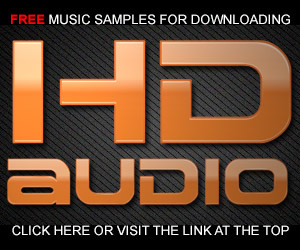 No EQ, no dynamic processing, no mastering, no artificial reverb…all in the digital domain. No conversions. But it’s the production procedures that make all the difference. I record in a large venue, use stereo mic techniques etc. I release on Blu-ray, files, and DVD-Audio/Video. So where do I buy your products? You can purchase the physical discs at aixrecords.com or file downloads at iTrax.com. Just saw your video partially explaining the Yarra 3D technology. Didn’t Polk speakers come out with this idea some years back, I believe in the 70s? Of course, I don’t think Polks speakers employed DSP technology. It was an intriguing concept then, but never seemed to catch on. I hope there is more interest in it now. The use of beamforming to direct audio has been around for a while. Both Yamaha and Polk have licensed it. The YARRA 3DX is an up-to-date version as developed by by friend at UCSD.